Home > Bicycle Tourism > Ride Bikes. Travel. Do Good. The bad news is that these merit badges can’t be bought. The good news is that they’re free and you’ll get two of them (more on that a little later). Ride bikes. Travel. Do good. This is our mantra. In all our years of traveling by bike, what has stuck in our memory more than breathtakingly beautiful sunsets, screaming mountain descents or (believe it or not) the joy of a well-timed greasy spoon diner … are the people. Traveling by bike affords us the unique chance to interact with both the landscape AND the people in ways the other modes do not. The bike is simultaneously transportation, adventure-mobile and conversation piece. We’ll never forget the inspiring fellow riders we’ve met (like a 65-year-old woman touring solo across America with a service dog in her handlebar bag), businesses that went above and beyond to accommodate us (like the KOA in Dillon, MT that saved a cabin for us because it was raining… or the owners of Fall Hollow who fired up the grill before their kitchen was open, to cook us burgers when they saw us hungry upon arrival) and other random acts of kindness or friendly interactions with people while traveling on the road. We have a large karmic debt to repay, and that is why we have dedicated a large part of our lives the last few years to focus on the “Do Good” part of our mantra. Bicycle travel and tourism has the potential to do amazing good to not only the traveler but the communities travelers pass through. We want to spread this message. Think of it as the social equivalent of “Leave No Trace.” Instead of just setting the bar at not leaving a mess, let’s strive to leave things a little better than when we first found them. 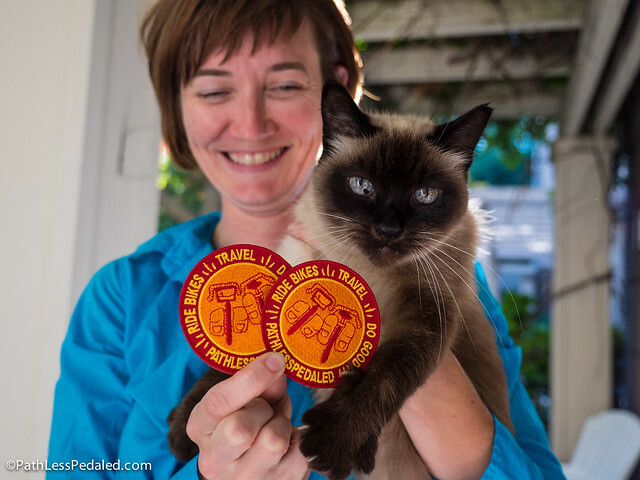 We want to encourage and recognize people who embody this idea of bicycle travel doing good. 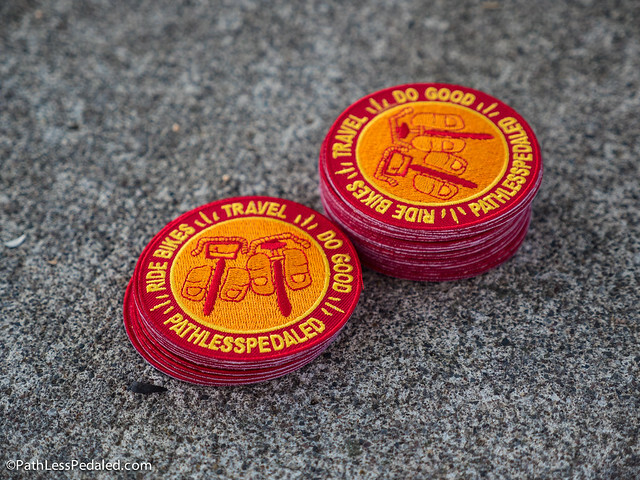 While a little woven merit badge is really a small token, it’s a start of a new narrative. We want people to ride bikes, travel and get rad… and also look at the larger picture, because one person’s Outback is another person’s Backyard. As bike travelers, let’s be better guests. As communities, let’s be better hosts. Our neighbors cat approves of this message. The merit badge is available for free to anyone (we do have a limited supply though) who also believes or embodies these ideals. Especially, the “do good” part. We want to give them to businesses who are particularly bike-friendly; to people in the travel and tourism industry who are reaching out to cyclists; to people in the bike industry who are promoting bike travel in a responsible and diverse way; to bike tourists themselves who believe it is important to be a good ambassador for this activity we love; and to anyone else who is positively spreading the love of bicycle travel. We need your help in finding these people (it could be you or someone you know or someone you met months ago on your last bicycle adventure.) Email us, contact us or tag us on Instagram with the hashtag #ridebikestraveldogood – and tell us about that person. When you contact us, send us the person’s name, contact information (so we can notify them), photo and three to five sentences about how they #ridebikestraveldogood. We’ll feature this on our site and other social media channels. That person will get two merit badges. One for themselves and another to pay forward when they encounter someone who is a good ambassador for bicycle travel. After you or the person you’ve nominated receives the merit badge, please send us a photo of you and the badge! That’s it. We have no intention of selling these. We just want people to look beyond “getting rad” for a second and be more conscious of the landscapes and communities they go through. We only have a limited run and the badges will be given out very intentionally so let us know of someone who should get one today! That’s such a cool idea, not sure if I qualify for a merit badge, but in the past three or four months I have been riding my bike to do errands that are les than 5 miles from my apartment and if all goes well in the next couple of weeks with work, I definitely will be riding my bike to work. I’m a nurse and do home health and my jobs are like three miles from where I live. On other days when I get a chance I ride just to ride. This past weekend I set a goal for a 10 mile ride and I did it. And it felt good afterwards. Who needs a car to travel when you have your bike and so many beautiful bike roads to explore! I just love love love this! So many people come to mind. And, yeah to you for getting it going! Thank you! What a great and simple idea that has the power to further transform! I’ll send my nomination in soon. Thanks for taking the initiative on this Laura snd Russ! I’m an avid cyclists and musician in Atlanta Georgia, and would love to get involved. This is a great idea! What a great way to reward folks who do good. I’m inspired.